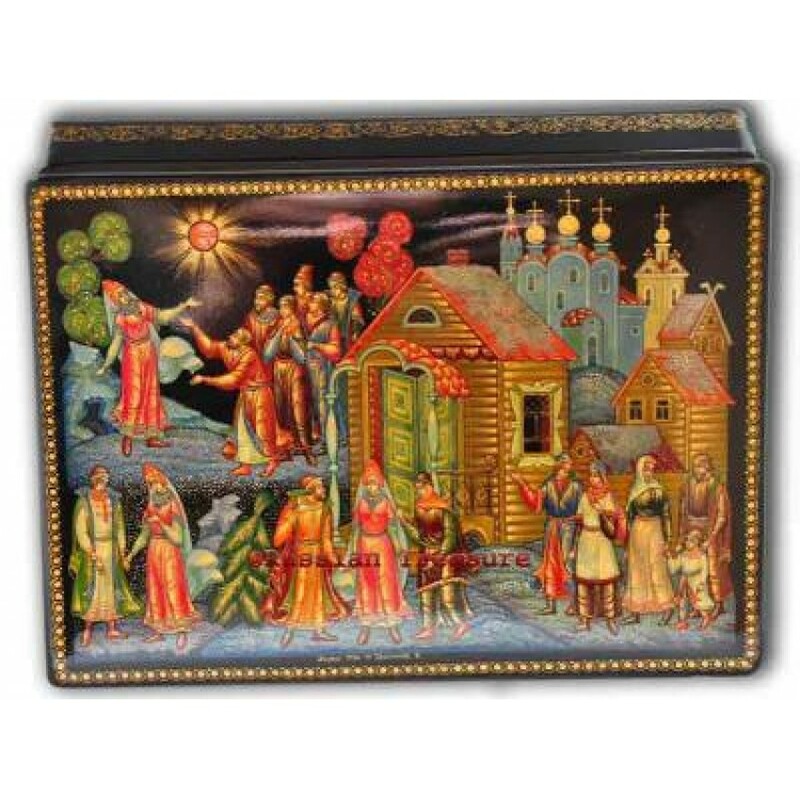 A truly unique piece of Russian artistry, this exquisite Lacquer Box from the village of Palekh was hand crafted and painted by a famous native Russian artist Vladimir Prokofiev. Featuring one of the most favorite folk tales, the Snowmaiden, this Palekh Lacquer Box represents an age-old custom of depicting traditional fairytale motives by the artists on their objects d’art. Creating this lacquer box, the author managed to dwell on the multiple themes from the fairytale: the old man and his wife, after having prayed for so long, are finally given a daughter to raise – Snegurochka (the Snowmaiden); Snegurochka then meets Lel’, a village musician, and she realizes that she wants to fall in love but cannot. And the final scene, in the upper corner of the lacquer box, featuring the very end of the story, when the sun comes out and the Snowmaiden melts into a light cloud. Despite the fact, that the Snowmaiden dies, the story has a hopeful ending as with the death of Snegurochka spring arrives to the Earth and Nature rejoices. The lacquer box is completed in the traditional lively Palekh style. The images painted in bright tempera against the black background neatly blend into each other. The artist paid special attention the snow which representation produces an impression of water-color painting. Multiple thin color layers that are used to prime the surface of the Palekh lacquer box add more vibrancy to the general composition of this piece of Russian artistry. The rich application of gold and silver hues combined with the intricate aureate ornaments that decorate the edges and the sides of the box make this Palekh lacquer box shine from within. The same effect is achieved by the unique lacquering technique, as the box has been hand varnished several times to achieve a remarkable flare. This Palekh lacquer box has a flat bottom and a hinge on the side. The interior is lacquered with deep red varnish. The author has put his signature and the year of manufacture at the bottom of the box lid. 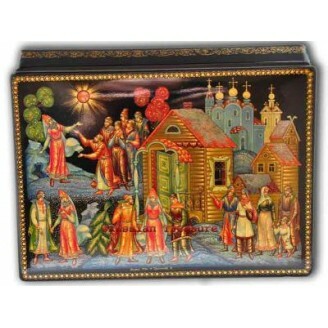 The lacquer box will make a most appreciated gift to those who love Russian artistry or simply enjoy true objects d’art.